Keenan Allen arrives at Pro Bowl practice on Friday, Jan. 25, 2019 in Orlando, FL. Derwin James takes the field at Pro Bowl practice on Friday, Jan. 25, 2019 in Orlando, FL. Melvin Gordon warms up before Pro Bowl practice on Friday, Jan. 25, 2019 in Orlando, FL. Adrian Phillips takes the field at Pro Bowl practice on Friday, Jan. 25, 2019 in Orlando, FL. Melvin Gordon at Pro Bowl practice on Friday, Jan. 25, 2019 in Orlando, FL. Derwin James defends at Pro Bowl practice on Friday, Jan. 25, 2019 in Orlando, FL. Melvin Gordon carries the ball at Pro Bowl practice on Friday, Jan. 25, 2019 in Orlando, FL. Texans QB Deshaun Watson, Derwin James and Jaguars CB Jalen Ramsey pose for a photo during Pro Bowl practice on Friday, Jan. 25, 2019 in Orlando, FL. Melvin Gordon catches a pass from Colts QB Andrew Luck at Pro Bowl practice on Friday, Jan. 25, 2019 in Orlando, FL. Derwin James defends as Browns WR Jarvis Landry prepares to catch the ball at Pro Bowl practice on Friday, Jan. 25, 2019 in Orlando, FL. Mike Pouncey looks at Texans QB Deshaun Watson during an AFC huddle at Pro Bowl practice on Friday, Jan. 25, 2019 in Orlando, FL. 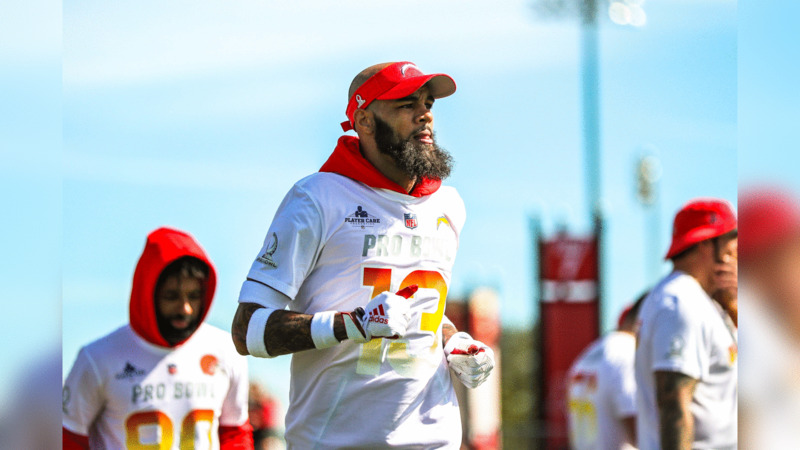 Keenan Allen at Pro Bowl practice on Friday, Jan. 25, 2019 in Orlando, FL. Derwin James smiles at Jaguars CB Jalen Ramsey at Pro Bowl practice on Friday, Jan. 25, 2019 in Orlando, FL. Melvin Gordon practices a one-handed catch at Pro Bowl practice on Friday, Jan. 25, 2019 in Orlando, FL. Keenan Allen dances during warmups at Pro Bowl practice on Friday, Jan. 25, 2019 in Orlando, FL. Derwin James runs during a drill at Pro Bowl practice on Friday, Jan. 25, 2019 in Orlando, FL. Melvin Gordon runs with the ball at Pro Bowl practice on Friday, Jan. 25, 2019 in Orlando, FL. Keenan Allen laughs during Pro Bowl practice on Friday, Jan. 25, 2019 in Orlando, FL. Jets safety Jamal Adams, Texans QB Deshaun Watson, Derwin James and Jaguars CB Jalen Ramsey pose during Pro Bowl practice on Friday, Jan. 25, 2019 in Orlando, FL. Derwin James blocks a pass intended for Browns WR Jarvis Landry at Pro Bowl practice on Friday, Jan. 25, 2019 in Orlando, FL. Derwin James at Pro Bowl practice on Friday, Jan. 25, 2019 in Orlando, FL. Derwin James communicates at Pro Bowl practice on Friday, Jan. 25, 2019 in Orlando, FL. Melvin Gordon walks alongside Browns WR Jarvis Landry at Pro Bowl practice on Friday, Jan. 25, 2019 in Orlando, FL. Melvin Gordon catches a pass at Pro Bowl practice on Friday, Jan. 25, 2019 in Orlando, FL. Keenan Allen after catching a pass during at Pro Bowl practice on Friday, Jan. 25, 2019 in Orlando, FL. Texans QB Deshaun Watson and Derwin James at Pro Bowl practice on Friday, Jan. 25, 2019 in Orlando, FL. Melvin Gordon laughs during Pro Bowl practice on Friday, Jan. 25, 2019 in Orlando, FL. Melvin Ingram at Pro Bowl practice on Friday, Jan. 25, 2019 in Orlando, FL. Melvin Gordon smiles at Pro Bowl practice on Friday, Jan. 25, 2019 in Orlando, FL. Melvin Ingram signs autographs for fans after Pro Bowl practice on Friday, Jan. 25, 2019 in Orlando, FL. Melvin Ingram signs autographs for fans at Pro Bowl practice on Friday, Jan. 25, 2019 in Orlando, FL. Keenan Allen signs autographs for fans at Pro Bowl practice on Friday, Jan. 25, 2019 in Orlando, FL.